The Duck League is entering its 10th season in 2019! The league is an individual match play league comprised of 4 flights (A, B, C, & D flights). All golfers of varying abilities and age are invited to join the league. League play begins on April 29 at 5:00 p.m. and is held each Monday at that same time. Upon conclusion of the handicapping rounds each player will be assigned a flight (A, B, C, D & E). You will square off each week against an opponent in your flight. You will play your match play round against your opponent and you will either have to give/take/ or draw even on strokes that are allotted for you and your opponent. It is okay to concede putts as long as the putt is for bogey or worse. Since skins can be awarded for pars they must be putted out. Match play is played on a hole by hole basis. Let me know if you have any questions regarding match play and I’ll help out. Everyone will be assigned new handicaps each week based on all of your scores. However, everyone will stay in the same flight that they were originally placed in to begin the year. We will crown a Regular Season Champion for each flight. Champions will be determined by the most amounts of points accumulated during regular season play. We will also give away prizes for 2nd and 3rd place. All cards must be turned into the active manager in the clubhouse at the end of each round. Handicaps will be managed through our league manager software and the maximum handicap a player can have is +18 for 9 holes. Jungle Golf – If your ball is hit out of bounds or into a hazard you may play a provisional ball or spot your ball at the nearest entry point to the hazard and penalize your score for that hole with a one stroke penalty. You may move your ball anywhere with your club head within six inches from the original spot (everywhere but the fringe and green). However, do not improve your position (i.e. around a bush/tree). No gimmes, no mulligans. No loss of distance or out of bounds. Drop your ball within two club lengths of the point of entry. Maximum Stroke Rule – The highest score that may be allotted is a 10 on any hole. If you have reached 10 please pick up your ball and move onto the next hole. All Men will play from the white tees, ladies from the reds, and seniors (65 & older) may play from the gold tees. If you plan on missing any particular week please let Matt and your partner know, so that we are not waiting for you to arrive. Make up matches are allowed but they must be okay’d by your opponent and your score must be verified though a witness. Makeups must take place within two weeks of the scheduled playing date (barring the last week of play). If a player does not show up for their match and makes no plans for a makeup then their match will be forfeited. Playoffs will start with a double elimination tournament. Points accumulated over the course of the season will determine seeding for the playoffs. Playoffs will start midway through July and continue until a champion is crowned. All players are entered into the playoffs. Playoff seeding is based on how you finish during the regular season. We play in a double elimination playoff format so if you lose once you are still guaranteed another match in the loser’s bracket. All matches are still match play format in the playoffs and cannot result in a tie. Ties will be broken by either a “chip and putt off” on the putting green or extra holes. For the “chip and putt off”, both players will find a spot to hit a chip to a designated hole. You will then putt out from there. The player that has less strokes until the ball is holed will determine the winner. For extra holes, you will play as many holes as it takes to determine an outright winner. Skin & Pin games will be voluntary for each golfer. Your name and $5 must be put into the skin box before you go out to play. Shots will be considered valid for the pin shot if you are on the green (not the fringe) and you have signed up for the pin contest. All others will be excluded from skins and pins if money and name is not registered in the clubhouse. The money allotment works as follows: upon entry $2 from each participant will be added to the two pin shot prizes and the remaining $3 dollars will go into any skins prizes. Skins will only be awarded for scores of par or better (a skin will not be rewarded for bogeys). If there are no skins, then money will be split amongst the pin shot winners. If there are no pin shot winners, then the money will be allotted towards the skins game. If no skins or pins are awarded for that week, then the money will be carried over for next week. 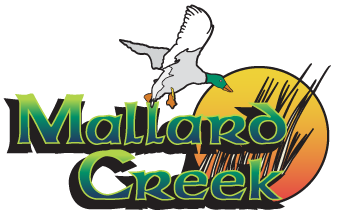 For more details call Matt Kershner at (440) 748-8231 or email him at MattK@TheMallardCreek.com and he will be glad to tell you more about the Duck League! Spots are still available – Join today! Ohio’s #1 golf membership, the Fairways Golf Membership, is open for you and your friends to join. Memberships are not good for leagues and outings as those groups book tee times further in advance than others are able to.